Nope. This is not some attempt at creative title writing. This is the name of the restaurant. Apparently, this place was a corner store that sold everything and so the mayor of the region nicknamed it a place to get everything from cabbages to condoms and the name stuck. Growth didn't. They now have many restaurants all over Thailand. Located one street away from where we stayed, we chanced on it. While my title didn't have to be creative, the set up was. Dolls (including a life size Santa) made of condoms. Lampshades shaped like condoms and so many free condoms all over, I am yet to figure out why they bothered to retain Cabbages in their name. But when it comes food, they didn't leave out anything. 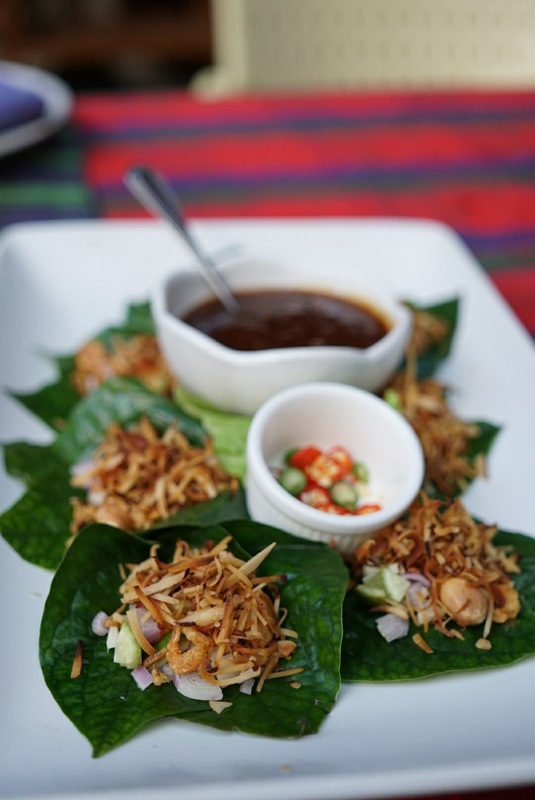 Betal leaf with dried ginger and dried shrimp set the pace for lunch. 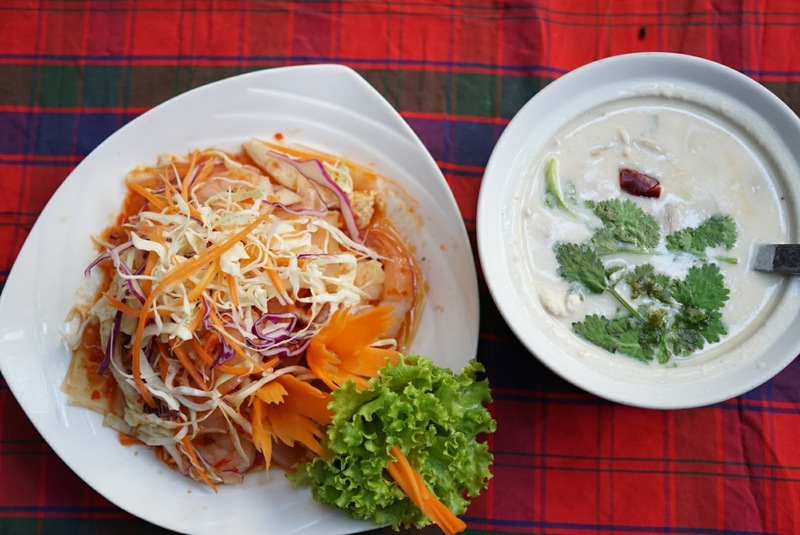 Going with the waitress' recommendation, we got ourselves a Tom Kha and Chicken Prawn Salad with glass noodles for starters. Both were generous with the serving of meat. The Tom Kha was full bodied coconut flavoured broth with a deceptively large serving of chicken and mushrooms inside. With two of us sharing the soup, it took us a while to realise the amount of meat left in the bowl as we polished of the soup. The salad had no such trouble. 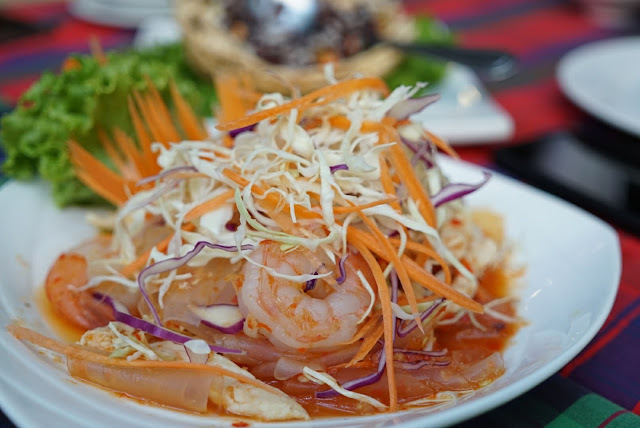 It was evident that there was generous amount of prawns, but the cabbage did manage to hide the amount of chicken in the salad. While the soup was an example of cooking and adding flavours, the salad showed how simple ingredients can make a fantastic dish. A simple chilly dressing over noodles, chicken and prawns, this was an excellent appetiser. Already feeling full, we got ourselves one portion of 3 coloured rice and a yam gravy for our Tuesday-vegetarian friend. 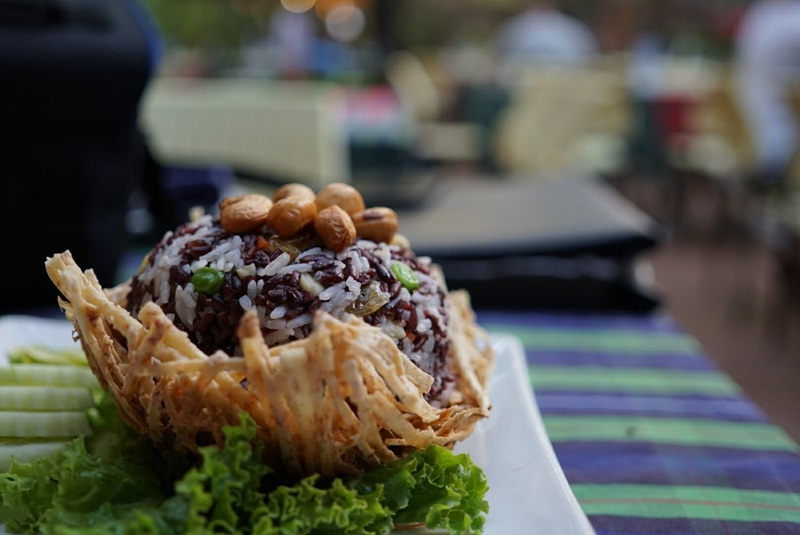 With white, brown and black rice hiding peas, carrots and nuts, the rice was good as is and the yam gravy added no benefit to it. 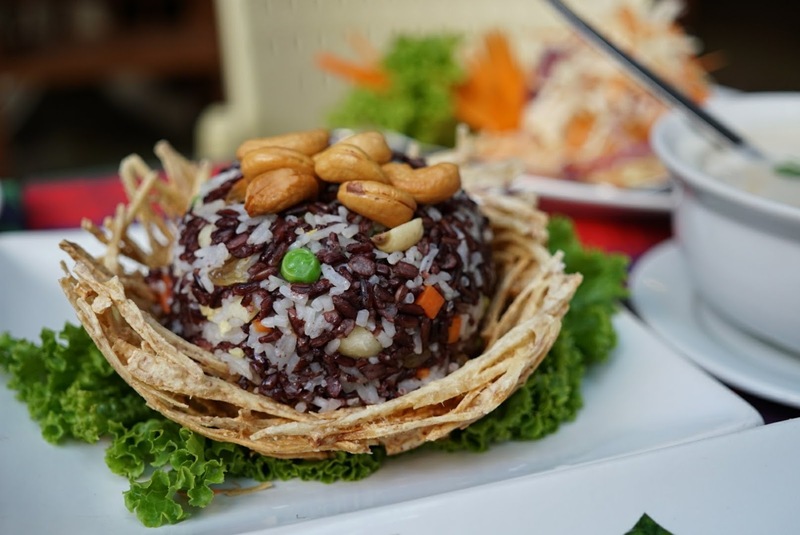 The edible rice bowl helped fill the tummy by adding a nice crunch element to the dish. 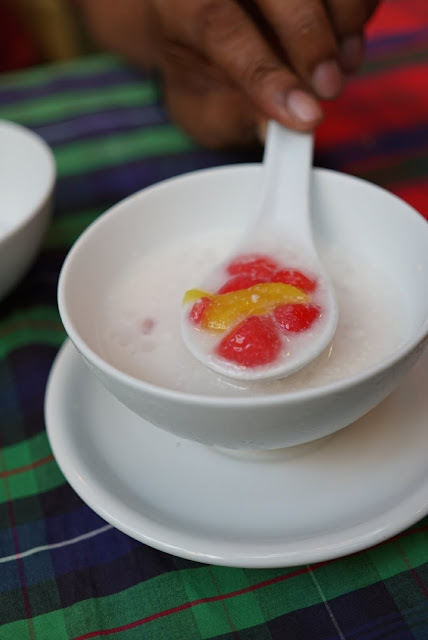 Water chestnuts in coconut milk (Tub Tim Krob) and a very interesting rice balls in ginger syrup completed dessert. The bill arrived with 3 condoms. This is probably their way of 'happy ending.' The meal set us back by about 1800 THB (about Rs. 3600 for 3)! Cabbages and Condoms is on Sukumvit Soi 12, a few meters further down LAVANA, a wonderful spa.